The SawSquare is a simple, inexpensive, and remarkably easy-to-use tool that allows even unskilled woodworkers to make truly precise square cuts (plus or minus 1/128") with a portable circular saw - every time. It's a "must have" tool for every handyman, siding contractor, finish carpenter, and cabinetmaker. With the waste part of the board to your right, mark the desired length of the board with a sharp pencil or knife at the edge of the board away from you. The accuracy of your mark determines the accuracy of the cut. Align the end of the SawSquare's rail with the mark just made. One technique that produces extreme accuracy is to make the original mark with a knife, then rest the knife edge in the mark and slide the SawSquare until the end of the rail touches the knife blade. Holding the SawSquare and workpiece firmly in place with the left hand as shown, guide the saw through the cut, keeping the saw's sole plate against the SawSquare's fence throughout. A 3/4" wide by 18" wooden rail is ripped from the edge of a piece of 1" scrap wood and screwed to the SawSquare as shown in the above two illustrations. The right end of this rail is cut off when the first (calibrating) cut is made as described in Step 3 above. Only after this "calibration" cut has been made is the SawSquare is ready for use. Important! 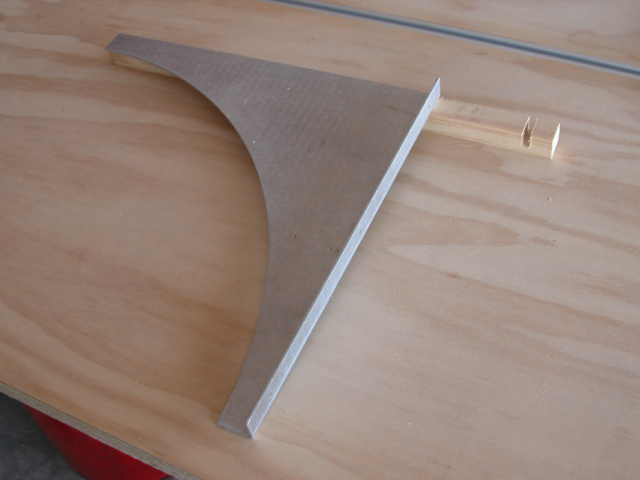 A fresh rail must be installed and "calibrated" as above whenever the SawSquare is used with a different saw or sawblade (even on the same saw). Although the SawSquare does provide an additional measure of control in the use of your power tool, please read and abide by your power tool manufacturer's instructions and safety precautions. Especially, I'd like to encourage you to not only wear safety glasses but to keep at least one spare pair in your tool box and another at the entrance to your shop (for visitors and family). When you use your SawSquare with a power tool that requires two hands for safe control (such as a router) you should use clamps to hold the workpiece and SawSquare securely to a firm support - and then use both hands to control the tool safely.